Alfred M. Green, a pioneer farmer and resident of Parker County, was born November 6, 1833 in Raleigh, North Carolina. He married Eliza Ellen Decker born June 2, 1845 from Martinsburg, Blair County, Pennsylvania. Sometime between the years 1857 and 1861, Alfred M. Green was granted a quarter acre section (160 acres) of land in Precinct 1, the Wright Community, Parker County, Texas where he established a working farm. In 1862, Alfred M. Green enlisted to serve the Confederate cause in the American Civil War as a Private in the 5th Regiment, Texas Cavalry (5th Mounted Volunteers) from Parker County, Texas, Company K. His muster out of service year was 1864. 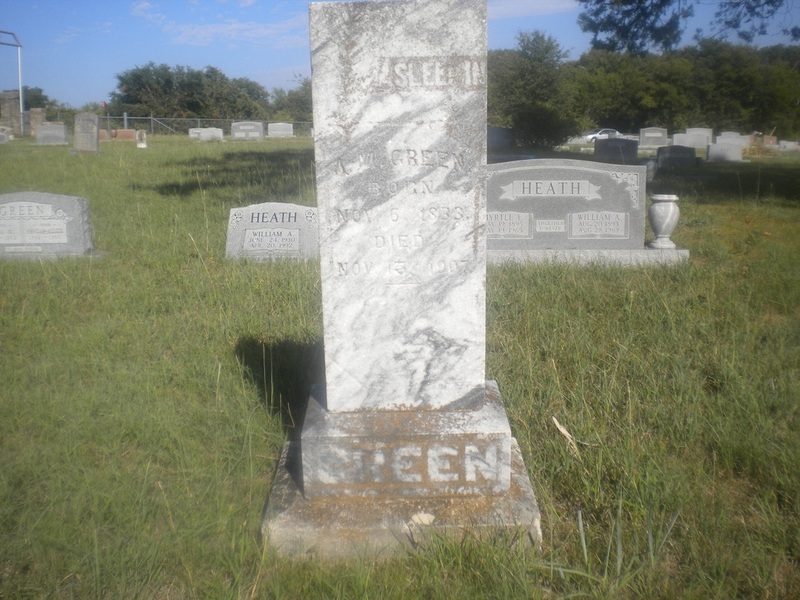 Following his service to the Confederacy, his wife, Eliza Ellen (Decker) Green, mother of two children, passed away at the age of 23, on March 21, 1868, in Parker County, Texas. According to the 1870 United States Federal Census, Alfred M. Green, a widower, and his two children are found living in Precinct 2, Parker County, Texas. The 1880 United States Federal Census records the Green family living in Weatherford, Texas. The 1900 United States Federal Census documents the Alfred M. Green family living in Justice Precinct 2, Parker County, Texas. Alfred M. Green, American Civil War veteran and pioneer farmer died November 15, 1907 in Parker County, Texas. He is buried beside his wife Eliza Ellen (Decker) Green who predeceased, Alfred, her husband, by 39 years. Alfred, Eliza E., their daughter Olevia Lee (Green) Dobbs and their grandson Orville Austin Green (1892-1960) are buried in the family plot at Clark Cemetery along with many other descendents.